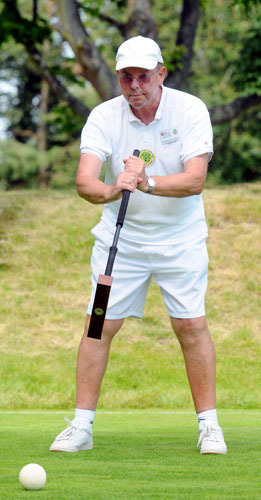 As near as possible to the longest day, this annual Golf Croquet Doubles competition for 2012 was hosted by the Ryde Lawn Tennis & Croquet Club on 17th June. Unfortunately it was also Fathers’ Day, so there may have been a reluctance to release husbands and dads for a day out on the Isle of Wight, as well as the distance for those in the north of the region in Berkshire and Oxfordshire. The visitors were welcomed by a glorious day, with the courts having received an early morning cut thanks to Philip Kennerley, and the Club looking wonderful. 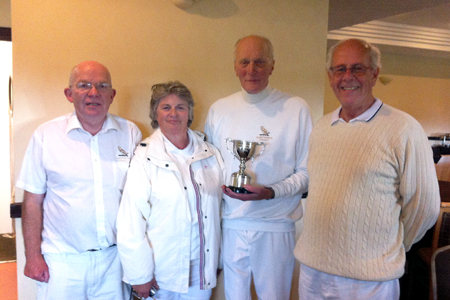 Representatives from Phyllis Court, Henley, were Terje Johanasen and Charlie Von Schmieder, the defending champions, together with Chris Roberts and Frances Colman. 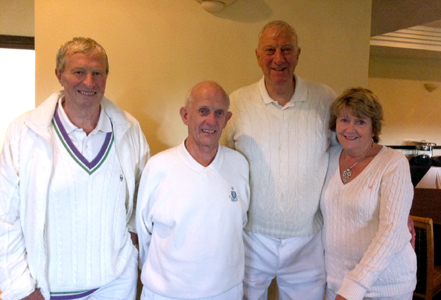 Thames Valley Club, Abingdon was represented by Jim and Valerie Pertwee with Norma Rayne and Gerald Mitchell. An entry from Harlow unfortunately came too late, so with four pairs from Ryde, the field consisted of eight teams with each playing all the other teams in a single block. Games consisted of a single 13 point game with a time limit of 45 minutes. The defending champions, Phyllis Court 1, started well and won their first three matches, despite being pushed hard by the Ryde 4 pair of Pamela Sim and Joan Grove, who were unable to make the tie break hoop. Terje and Charlie then played the Phyllis Court second team of Chris and Frances, and were held to a 6-6 draw on time. At lunch they were ahead of the field with 3 wins and a draw. 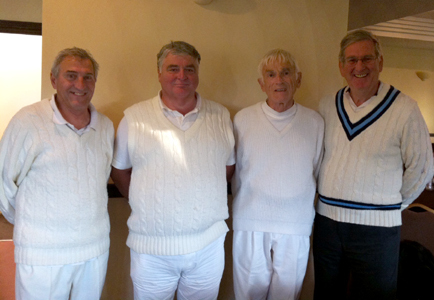 Meanwhile, Ryde 1, Alan Truckel and Roy Tillcock had lost the second game to Norma and Gerald by 6 to 7, and had drawn 4-4 with Ryde 2, Robin Thornton and Dave Willett. The surprise of the morning was Ryde 4, Pamela and Joan, beating Robin and Dave by 7-6. Ryde 3, Richard Harris and John Sim had two wins after a shaky start. Two more games after lunch left three teams at the top of the leader board. Phyllis Court 1, Ryde 1 and Ryde 2 all had 4 wins and a draw each, with the first two due to play each other. Ryde 1 went ahead taking the first three hoops. Defensive play slowed down the scoring and just before time, Charlie ran hoop 7 with red to make the score 5-2 to Ryde. On time there were 8 more shots allowed and Roy played black to just in front of hoop 8 to give him a scoring chance with his last shot. Alan decided to shoot at hoop from a distance with blue and only succeeded in clearing his partner ball! Even so Ryde 1 had won. Meanwhile, Robin and Dave were playing Phyllis Court 2 and had been forced to a tie break 13th hoop. After an exchange of positioning and clearances, Robin eventually made the winning run from the middle of a cluster of balls in front of the hoop. The result was then a tie between Rye 1 and Ryde 2 with 5 wins and a draw each, the draw having been between the two of them in the morning. As previously announced, this meant a count back on hoops with the higher hoop difference being the winners. 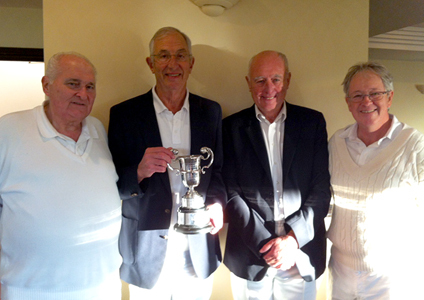 Ryde 1 had scored + 15 and Ryde 2 were slightly behind with + 11, so Alan and Roy were declared the winners. The trophy, now renamed the Norma Rayne Solstice Challenge Cup, to honour her long service organising Golf Croquet events in the Southern Federation, was presented by Norma herself. Gary Yates (Winchester) and Sue Bradley (Hamptworth) teamed up to head six pairs at this season's AC Doubles Touranment. Home pair Keith MacKenzie-Ross and Glynis Hassell stumbled at the last hurdle to finish runners-up. Several fixures in both our AC & GC Leagues were postponed this week but most competitions are progressing nicely. See the League Buttons (left) for Results and latest Tables. Roger Barnacle (pictured right) won coverted Six Lawns AC Trophy today, beating a field of over 20 with an international flavour this year. Taking good advantage of Hamptwoth's four lawns to enarge the event on last season, organiser Richard Stevens invited memebers of Dublin's Carrick Mines Club to enter. In the end though, local talent prevailed and Barnacle, of the Dogmersfield and Winchester Clubs, emerged victorious after three days play also hosted by Winchester and Littleton. The Wiltshire GC Open hosted by Hamptworth fell victim to this month's likely record rain fall and met the same fate as the cancelled Ryde GC Open three weeks ago. Blewbury's Paul Wolff (right) found the fast courts at Hamptworth to his liking once again, as he won this weekend's AC Tournament ahead of a field of 12. In a close final against hitherto undefeated Keith MacKenzie-Ross from Winchester, Paul pulled clear in the closing stages afier spending most of the game with score tied or thereabouts. 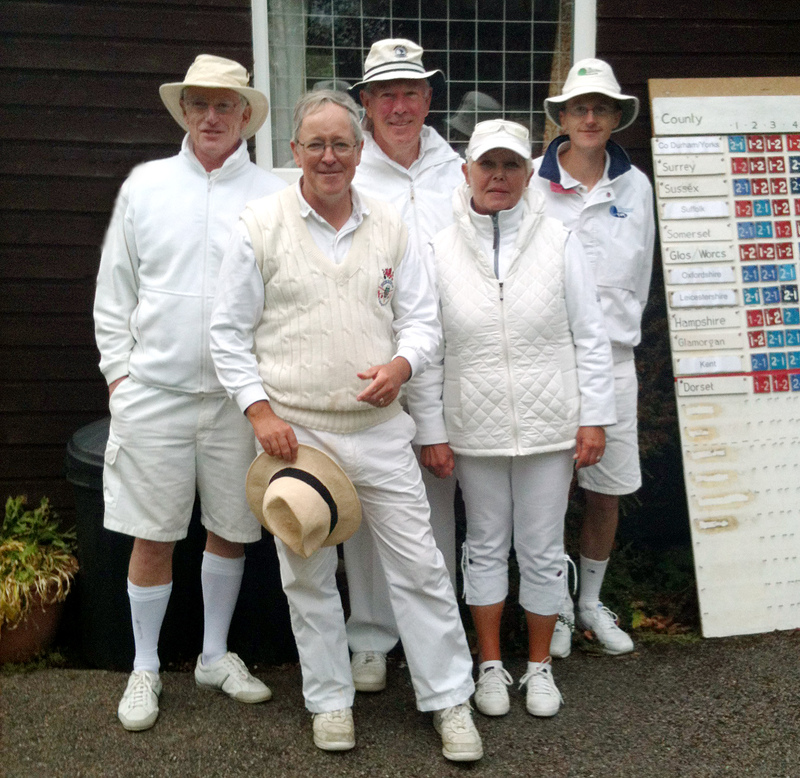 The tournament was expertly managed by host Richard Stevens, who had attracted competitors from 9 different Clubs; some of whome had traveled a jolly good way to take part. Along with defending cup holder from Watford Geoff Johnson and Woking's Michael Hague, if there had been a long distance prize it would surly have gone to Johnothan Toye all the way from Norfolk. 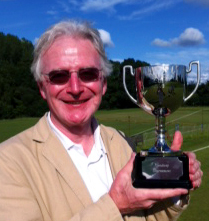 And so Paul Wolff can add this Hamptworth Cup to the Peels that he also won at the lovely Wiltshire Club. Well done Paul! by 31st August will qualify for League Table calculations. You can see the current standings via the 'GC Leagues' button (see left). 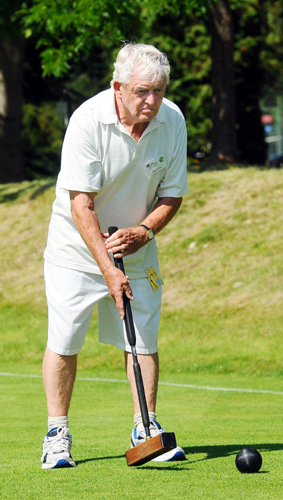 Phyllis Court's first Croquet Association GC 'B' Level Tournament for 'Smokey's Cup' proved a huge success and ended with victory for Raymond Wood of the host Club. Holding off a challenge from 15 other players from 9 different clubs, Wood ended the two day event with just 3 defeats, once the all play all format had been completed. 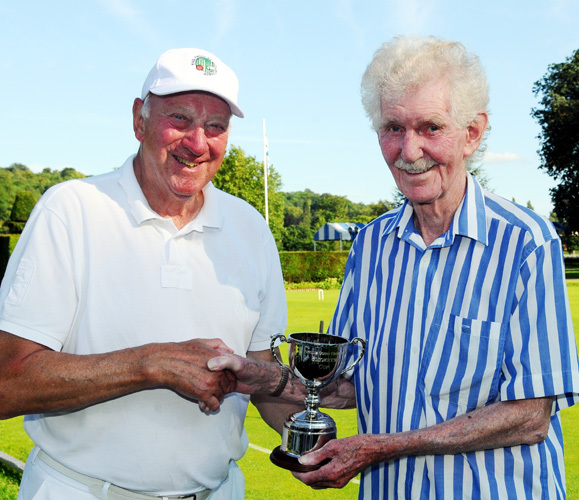 This gave him a clear 'two wins' margin of victory over his nearest rivals Richard Keighley (Wingrave) & Dan Ellis (Eyensham) and he was all smiles when recieveing 'Smokey's Cup' from the man himself, Phyllis Court Croquet President Smokey Eades. From far left: Raymond Wood of Phyllis Court recieving congratulations as winner from Club President Smokey Eades, Richard Keighley (runner-up), Dan Ellis (3rd) Michael Wiles (4th), Andrea Huxley (Gulidford, the early leader). 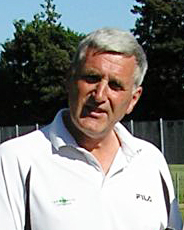 The re-arranged Wiltshire Open was won bt Richard Dickson from host club Hamptworth. 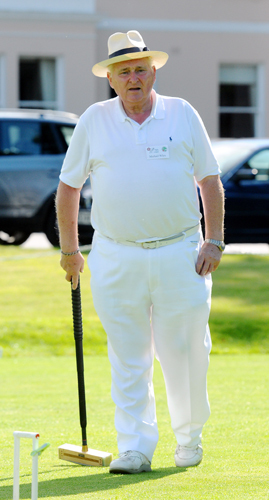 Richard duly qulaifies for the pretigious English National GC Singles Chaampionship (The Ascot Cup) to be held at Hurlingham on 22nd-23rd September. He joins another SCF player Chris Roberts of Phyllis Court in qualification. Blewbury's Susan Tilbrook won through the Southern Area Final of the All England GC Handicap Competition held at Haptworth today. And as an extra feather in her cap, her outsatnding play earned her a handicap reduction couresty of Competition Director Chris Roberts and fellow CA Handicaper Simon Carter. Roberts of Phyllis Court was assited in management by fellow SCF Committee member Frances Colman and the pair congratulated Hamptworth on again producing such good courts and facilities. Colman will be managing the National Final at Colchester CC on 22ns - 23rd September. Sadly the four other players from SCF Clubs (two each from Phyllis Court & Blewbury), failed to qualify, so Tlbrook will be flying a loan SCF Flag at the National Final. Winchester were just too strong for Phyllis Court today and beat them convinsingly 5 - 0 (with two rubbers tied). Fielding a formidable line-up of two scratch players (Nigel Hind & Robert Barnacle) and two AC specialists playing of GC handicaps of 2 (James Tutiet & David Nicholson), Winchester out gunned Phyllis Court on paper and then on grass as well. PCC's Chris Roberts drew his singles rubber with Tutiett after failing to seal victory with an apaulingly short shott to the 13th, and together with MIke Fensome, the visiting pair managed another draw in the doubles. Barnacle was taken to a third game by Helen Fensome but eventually won that rubber and it was straight games wins in all the other singles ties, with Frances Colman taking Nigel Hynd to the 13th hoop but eventually falling just short. Winchester will now play in the National Final on 29th Sept. at a venue to be decided, and they will face either Ashby or Dulwich. currently at one a piece. After a quick +26tp finish for Steve Woolnough against John McMordie, a win for Andy Myers against Bob Harris would have given Reading the title (I don't think Andy or Bob were aware of the situation). Andy had the first break to 4back, but Bob got in and eventually got to 'peg and peg' with an untidy leave, with Andy still 1&4b. Andy hit in and eventually embarked on a break with his backward ball until, in his words he "blobbed Rover". Bob pegged out to win +6 and Blewbury were Champions! Although we are still awaiting one result for the Northern Division and two for the Southern Division, the winners are decided. National Secretary's Shield competition next year (each Federation enters a team). This competition is run by the Croquet Association and we have a good track record over recent years. WINCHESTER Won the GC Level League - as there was a 3 way tie, Winchester win on the number of games won between the tied teams. PHYLLIS COURT ‘B’ Won the GC Handicap League North* - as advised at the beginning of the season, *The Final will take place at Hamptworth n Friday 28th September – 1100 start. All Trophies will be presented at the AGM to be held at Winchester on the 24th November 2012. (1030 start unless advised otherwise). Please contact me, Frances Colamn ( ) or Chris Roberts ( ) if you have any queries. I look forward to seeing you at the Golf Croquet 'End of Season Wash-up Meeting' to be held at Winchester CC on Saturday 10th November, 1030 start. 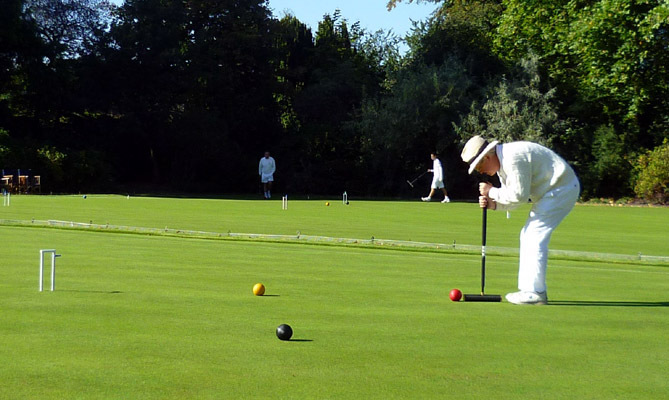 From Janet Trueman at Hamptworth - Does your Croquet Club close for Autumn/Winter? Would you like to go on playing during these months? At Hamptworth we keep our 4 excellent lawns open throughout the year (except in the worst weather conditions!) and in response to enquiries from players in the region regarding Winter membership, we are pleased to be able to offer croquet membership running 1 October to 31 March (6 months) for £95. Many of you will know we enjoy excellent facilities at Hamptworth, including the all day Clubhouse bar and restaurant. We have both AC and GC Club days throughout the week, and coaching is available to members. Lawns are normally available on most days of the week for members to book, though our popular AC and GC weekend events throughout the winter occupy two weekends each month. For further details, please contact Janet Trueman (Croquet Club Secretary) at janet.trueman@btopenworld.com or 01722 325410. The Final of the AC Handicap League Competition between the winners of the North & South Divisons (Phyllis Court & Littleton respectivly), has been fixed now to play alongside the GC Final at Hamptworth on Friday 28th September. Oxfordshire pushed Kent all the way to their victory in the GC Inter-Counties Championship yesterday, but fell just short by one match win. A terrific start on Saturday saw Oxon, as joint leaders overnight along with Kent and Glamorgan, and this was such a turnaroungd from the low finishing position of last season. Hampshire from our region also took part but their Ryde / Winchester combination had restluts go against them. More winter play oportunites have just been announced, this time by Nigle Hind of Winchester. His Club will be hosting a seires of 'One Ball' Tournaments, once a month. See the 'Upcoming Events' panel on the front page. Chris Roberts (Phyllis Court) will be boring everyone sencesless all winter with the tale of his shock defeat of five tme World AC Champion, Robert Fulford, at the English National GC Championships (aka.The Ascot Cup') at Hurlingham this weeknd. 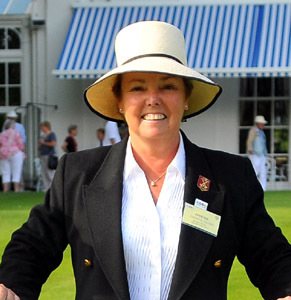 Meanwhile at Colchester, Frances Colman (Phyllis Court) was managing the All England GC Handicap Finals for the CA and Susan Tilbrook of Blewbury was in the field this weekend. It's just come to notice that Tony Newport af Eynsham won the CA's 'Grass Roots' competition on the 8th September. 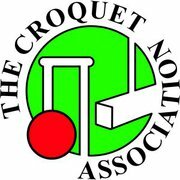 The CA's web site reports: Sixteen finalists from no less than eleven clubs from all over the country competed for the Grass Roots trophy (at Northampton CC), a GC competition for high handicap players, (range 9 – 12). All the players had fought their way through club elimination rounds and regional finals to reach this National Final stage of the competition. On a day which saw almost perfect weather for croquet, with warm sunshine throughout, seven rounds of progressive doubles produced four leaders who then went on to a four player knock-out stage. Tony Newport beat David Widdeson from Bishop Monkton CC in the final by 7-2. The Finals of our two Handicap Leagues were played side by side on Hamptworth's excellent and fast courts yesterrday. The hosts prevailed over Phyliis Court 'B' in the GC Final but the Henley club did just enough to defeat Littleton in the AC Final. First to complete their programme were the GC players, where an even 2-2 lunchtime scoreline had preceded an uncharacteristic slip from Phyllils Court, & Hamptworth sprited away to 7 singles successes & an impressive 9-3 victory. Harry Midgley then added the crucial fourth win to secure the title, which was just as well because Littleton fought right back to take the other three rubbers. So that one eneded 4-3 to a relieved Phyliis Court who duly qualify to represent the SCF in the National Secretary's Shield competition in 2013. 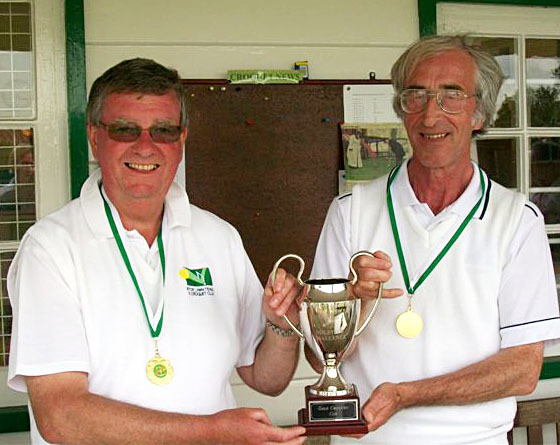 Ashby (fielding three scratch players) beat Winchester in the final of the 2012 Golf Croquet Inter-Club Championship despite Winchester putting up a stiff fight in the morning rubbers and gaining a 2-1 lead at lunchtime. Frances Colman again chaired the meeting that attracted a smaller turn out that last season's 'wash-up' meeting, perhaps because only some fine tuning was required to the arangements for next season's Leagues programme. 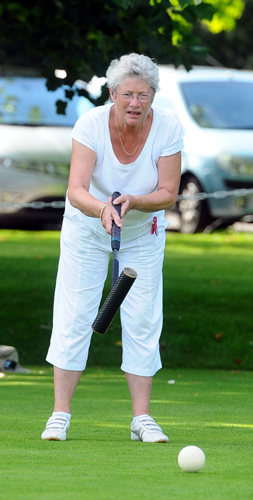 Frances Colman anounced that the 2013 Solstice Challenge Golf Croquet Doubles Tournament will be held at Thames Valley CC on FRIDAY 14th June.